You could write up your own set of Standard Operating Procedures for the production. Or you can buy and download this one and save yourself countless hours of work. Tough decision, huh? Hire a production services company to supervise production of a motion picture project with this Production Services Agreement. The producer (financier) will provide the financing for the picture, and the production service provider will oversee the operations of the film production, in line with the approved budget and production schedule. The service provider will be paid an amount equal to the financing required to produce and deliver the film. The financier will have right of approval over all expenditures and all business and creative decisions relating to the picture. The service provider will contract with all personnel, suppliers, film labs, licensors, etc. in its own name and not as the agent for the financier. As security for delivery of the picture, the production service company pledges all of its right, title and interest in the picture to the financier. The financier will be the sole owner of the copyright for the picture. If the film goes significantly over budget, or if an event occurs which might permit a takeover by the completion bond company, or if the service provider defaults, the financier has the right to take over production of the picture. When all elements of the picture have been delivered, or if the financier exercises its takeover rights, the service provider will assign all of its rights in the picture to the financier. Add the Motion Picture Production Services Agreement template to your production contract forms. This is a digital template which is easily modified to fit your specifications. 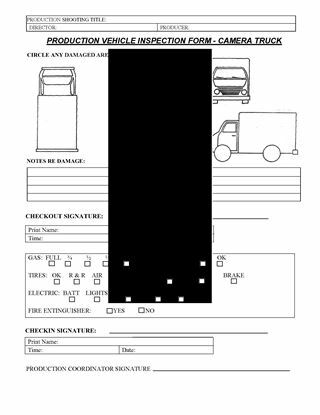 Each form has diagrams for indicating any damage to the vehicle, and a fill-in section to track gas, oil, fluids, condition of tires, battery, and electrical. Download the Production Vehicle Inspection Reports for your production office forms library. Routine maintenance inspections reduce downtime and keep repair costs down. Prepare a Business Plan for a rental property management company with this fully editable template form. You need a solid business plan in order to demonstrate to lenders and investors that your business venture is likely to succeed. This Property Management Company Business Plan template is totally customizable to fit your needs. Are you starting your own business? It is vital to the success of your venture to develop a realistic and thorough business plan. 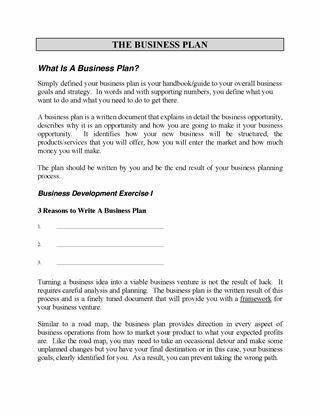 The Business Plan is a step-by-step training module created by Brian Robison of BPR Consulting. This guide will show you how to develop your business and marketing plan through a series of exercises and worksheets designed to help gather and organize the information you will need to write your plan. The module also provides an in-depth analysis of the structure and components of a typical business plan. Add 'The Business Plan' to your cart, check out, download and use immediately.